Today, we are comparing the Honor View 20 with the Huawei Nova 4. The comparison is based on specifications, features, and price. The Honor View 20 is the world’s first smartphone that features a 48MP AI-powered camera on the back. The phone is currently available on Amazon India for pre-booking. The smartphone is expected to come around Rs 35,000 (appx). However, there is no official confirmation came from the company yet. On the other hand, we have the Huawei Nova 4, which is a successor to the Huawei Nova 3 that is launched last year. The smartphone has a punch hole cut out at the front for a selfie camera and a triple camera setup on the back. 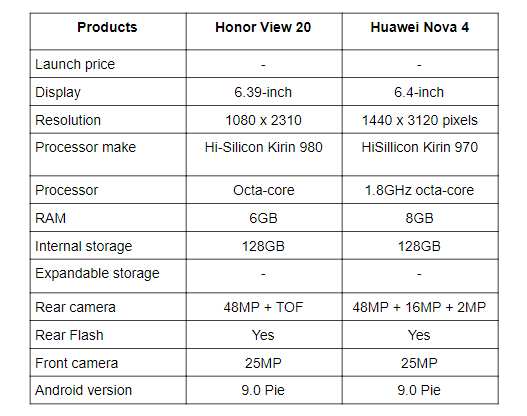 So, let’s begin with a quick specs comparison to know which Huawei device would be the right buy for you in terms of hardware at least on paper. The Huawei View 20 features a slightly smaller 6.39-inch display compared to the Huawei Nova 4, which comes with a 6.4-inch display. The Huawei Nova also offers a better resolution of 1080 x 3120 pixels than the Huawei View 20 that offers a resolution of 1080 x 2310 pixels. When it comes to the processor, the Huawei View 20 is backed by a Kirin 980 octa-core processor, while the Huawei Nova 4 is powered by Kirin 970 processor. 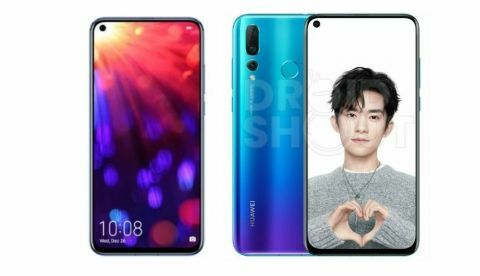 The Huawei View 20 will launch in two variants 6GB/128GB and 8GB/256GB, while the Huawei Nova 4 is launched in China with 8GB RAM and 128GB internal memory. Coming to the cameras, the Huawei View 20 has a dual 48MP + TOF camera set up at the back along with a 25MP selfie camera. On the other hand, the Huawei Nova 4 sports a triple 48MP + 16MP + 2MP camera setup on the back along with a 25MP sensor on the front. The Huawei View 20 is available on Amazon for pre-booking with an offer under, which you can get a free earphone of Rs 2,999 on booking the device in advance. On the other hand, Huawei Nova 4 has been launched in China already and is expected to come to India very soon this year.